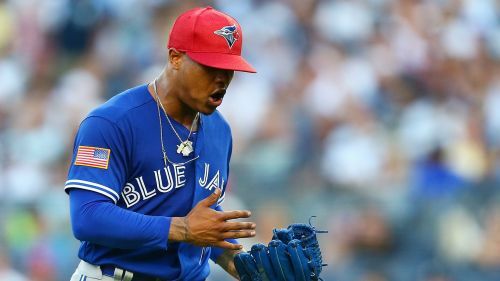 Toronto Blue Jays star Marcus Stroman lamented the lack of veteran leadership at the MLB franchise ahead of the upcoming season. It will be a new-look Blue Jays in 2019 after Charlie Montoya replaced John Gibbons as their manager in October. The Blue Jays also released Troy Tulowitzki and traded Russell Martin to the Los Angeles Dodgers, having dealt Josh Donaldson in August and farewelled Edwin Encarnacion and Jose Bautista previously. Blue Jays pitcher Stroman - the 2017 Gold Glove Award winner - spoke with the media for more than 20 minutes on Sunday. It was his first time in front of a crowd ready to take note of everything he said, and he sure had a lot to say. "There is really no veteran presence anymore," Stroman told reporters. "It's me and [Kevin Pillar], John Axford, a few other guys, Justin Smoak. I can't speak any more highly that the game needs to get to a point where we're starting to put these veteran players back in the clubhouse." This is not the first plea Stroman has made. He tweeted at free-agent outfield Carlos Gomez on Saturday and asked, "Where you at my bro!? Could use you and your clubhouse presence in Toronto!" Stroman, who is entering his sixth season with the Blue Jays, was also asked whether the lack-of-extension talk is bothersome. He equated it to a "business" ordeal. "Would it bother you? I play year to year pretty much. It's a business," he said. "It doesn't affect my relationship with the country of Canada. I'm able to disconnect the two now, between business and people. Just as long as the people know how I feel, that's all I really care about." Stroman signed a one-year, $7.4million contract in January to avoid arbitration. He has just one more year of arbitration before he can become a free agent in 2021. "I'm trying to remain hopeful, but I'm never going to be someone who settles," he said. "I know what I'm worth. I put in a ton of work daily. I know the type of pitcher I'm going to be over the next four, five, six, seven years. I take care of my body like no other. "Whatever it may be, it's a business. I haven't been approached with anything, ever, since I've been here so I don't even know how to talk about things like that." Stroman also had a number of things to say about the Blue Jays' offseason transactions, or lack thereof. "We're going to see," Stroman said. "We play against the Boston Red Sox and New York Yankees. I know their rosters, I play against their rosters all the time. If we match up, we match up. But that's not my job. I'm preparing all of us for what we have to do when we go out there. Are they doing what they need to do to put the best product on the field? "At the end of the day, I only care about what's going on in the clubhouse and I promise you, those 25 guys in the clubhouse, I'll have those guys ready to rock." Stroman struggled with injuries last season which limited him to only 19 games. He finished 4-9 with a 5.54 ERA.